If you love that classic blues rock sound then have we got a treat in store for you! Vintage Trouble is coming to The Wiltern on Wednesday 15th November 2017… these guys sure know how to get the crowd moving and clapping along from start to finish of their energetic set! There won't be a moment where you will want to stand still. Get ready for a true live concert experience, with their spot on harmonies, edgy guitar riffs, mind blowing solos and a lead singer that is full of surprises with his powerful vocal tone! Book your tickets today and put your hands together, for Vintage Trouble! 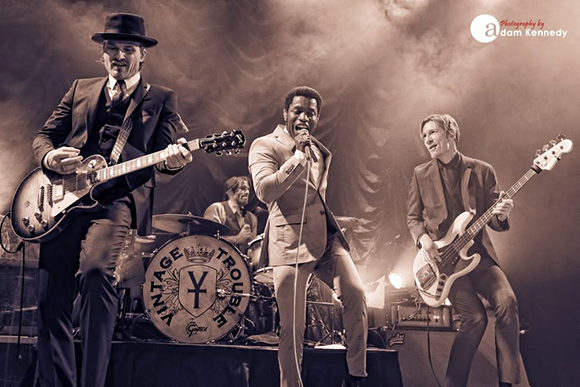 The American Rhythm & Blues band, Vintage Trouble are all about the feel good! With their effortless sound that brings to mind all of the greatest acts back in the day of Rock n Roll, they are all that anyone can talk about! As anyone who has seen them before will prove, they are one of the best bands right now to see live in concert! Often described as "Retro" they have elements from the late 1950's, 1960's in their music, taking inspiration from the legends such as; Chuck Berry, The Animals, The Rolling Stones and more. As they continue to improve and gather more fans where-ever they go, they have been able to smash out studio albums such as the successful "The Bomb Shelter Sessions" in 2011, "The Swing House Acoustic Sessions" in 2014 and "1 Hopeful Rd." in 2015. Their biggest triumph was of course their track "Today is Pretty Great" which got featured on the Honda Civic commercial! Now in 2017 they are taking to the venues across North America! Don't miss your chance to see Vintage Trouble this Fall/Winter! !